The city’s form is frozen in a place. Enter into a context of change and create something new without losing the existing identity. Push the boundaries of knowledge. 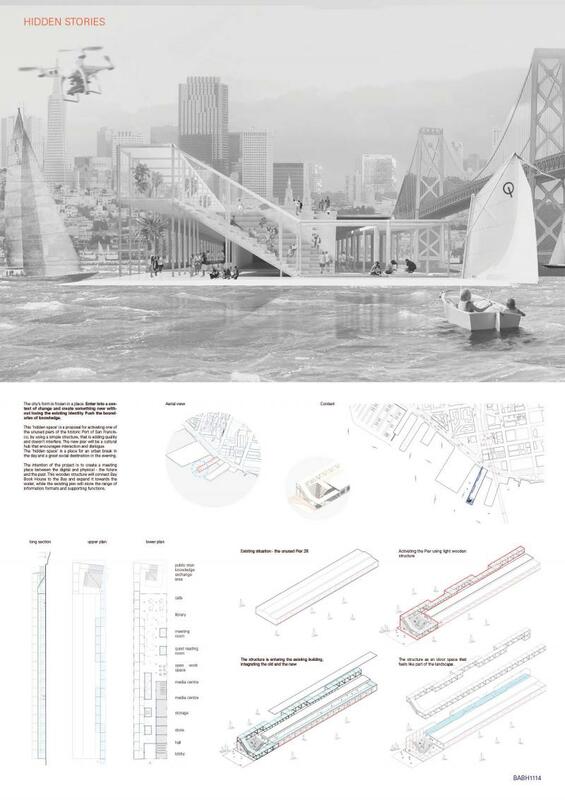 This ‘hidden space’ is a proposal for activating one of the unused piers of the historic Port of San Francisco, by using a simple structure, that is adding quality and doesn’t interfere. The new pier will be a cultural hub that encourages interaction and dialogue. The ‘hidden space’ is a place for an urban break in the day and a great social destination in the evening. The intention of the project is to create a meeting place between the digital and physical - the future and the past. This wooden structure will connect Bay Book House to the Bay and expand it towards the water, while the existing pier will store the range of information formats and supporting functions.